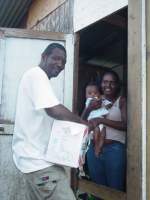 In September 2004 when hurricane Ivan destroyed Grenada United Caribbean Trust (UCT) worked in association with the Baby Survival Kit Foundation to be the hands of distribution for that excellent initiative. Seen here Tony in La Mode demonstrating Christ's love in action. 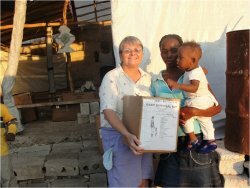 Following hurricane Ivan over 70 Baby Survival Kits were transported to St. Georges, Grenada by BARNUFO as a result of the sterling efforts of Mrs. Melanie Bishop founder of the Foundation. In the eventuality of a natural disaster they will be ready along with teams of young street evangelist to spearhead an immediate relief exercise. 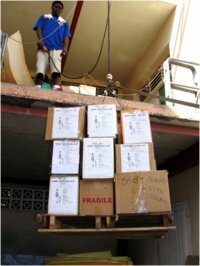 Lessons learned during this crises have been hard won and enduring, and has led to the desire to develop a team of relief workers who are prepared to put talk into action. 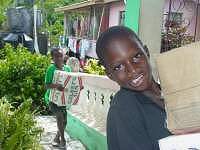 Jump onto relief boats at the drop of a hat and take in supplies to the most vulnerable within our community. 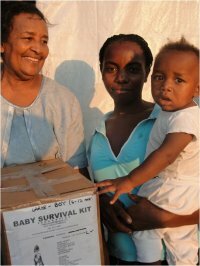 Following the earthquake that devistated Haiti in 2010 the Baby Survival Kits were ressurected and UCT was able to ship many of these vital Baby Survival Kits to Haiti. 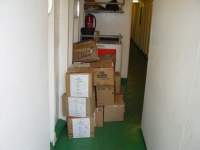 Seen here being packed from our warehouse in Newton, thanks to BIDC. 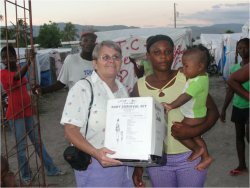 Seen here Jenny Tryhane the founder of United Caribbean Trust distributing into the many tent cites that quickly sprung up around Port au Prince following the earthquake. 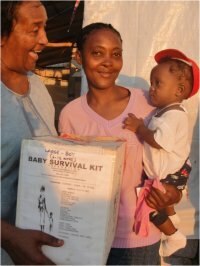 Haiti has again been hit this time by hurricane Matthew and once again UCT is trying to get help for the smallest and most vulnerable people - babies.